Texas Family Connects is an evidence-based, universal approach to supporting newborns and their families that is based on the highly-successful Durham Connects program. Research shows that 95 percent of all families have needs after the birth of a child. These needs are unique to each family. Texas Family Connects bridges the gap between parents and community resources and has been shown to improve family well-being, including reducing emergency medical care for infants and improving parent behavior and child care selection. Connect with every family in their home after the birth of a newborn. Offer supportive guidance to families, responding specifically to questions about newborn care. Help new parents connect with their infant, supporting child development and improving overall family well-being. In order to achieve these goals, the Family Connects model goes beyond just provision of nurse home-visits, it ensures that Community Alignment and Data and Monitoring are incorporated in the process. 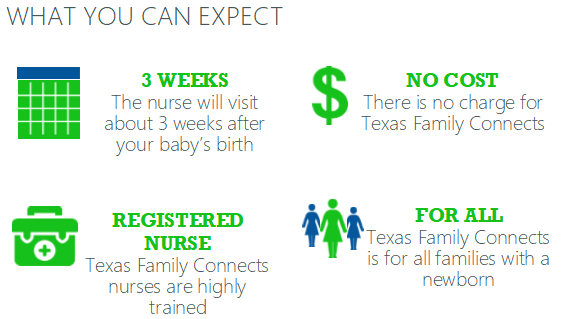 Texas Family Connects is only as good as what comes afterward - connecting families to existing community services, programs, and support. Each community that implements this program is required to engage a group of social service agencies, health care providers, and other recipients of these referrals into a Community Advisory Board. This group will meet regularly to share information about identified family needs, any changes to the resources available to families, and problem solve to meet the needs of families and fill the gaps in services that might be identified. Texas Family Connects is about bringing the community together to change our culture and to show tangibly that all families are valued and supported from day one.